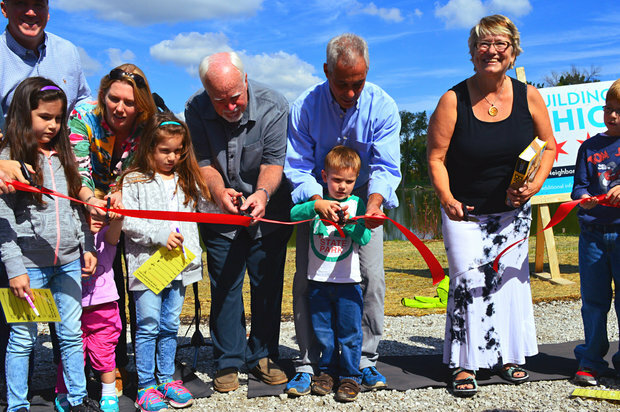 WEST RIDGE — After months of anticipation, the West Ridge Nature Preserve on Western Avenue finally opened to the public Sunday, and city officials, neighbors and nature lovers alike gathered to welcome the new park with a ribbon-cutting ceremony. Dozens of residents from across the city made their way over to see Mayor Rahm Emanuel address the neighborhood and explore the newly unveiled grounds. Ald. Patrick O'Connor said he was proud to be able to have "one of the most beautiful places in the city ... right here in the 40th ward," adding that the nature center's location is a significant part of Chicago's history. The preserve is located on a natural area of Rosehill Cemetery that was never used for burials. 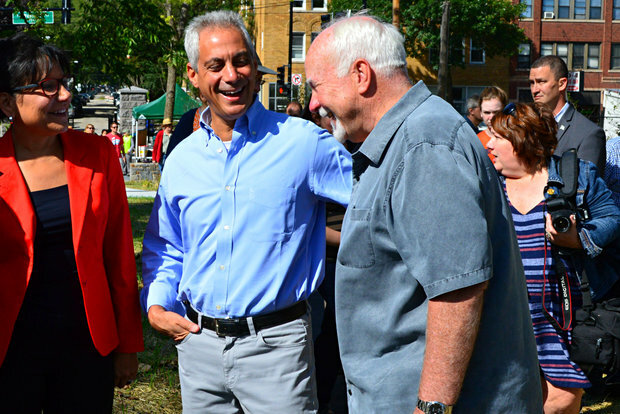 "This is a place that has great history for the City of Chicago. I think it's five mayors that are buried here — and there's a live one here, too," O'Connor said jokingly. He said the spot has a personal meaning as well, noting that nearly "everyone he knows" learned to drive on the little-trafficked roads of Rosehill Cemetery. Now, with a different purpose and layout, O'Connor said he hoped the preserve — on Western Avenue, stretching from Peterson to Bryn Mawr avenues — would become a "legacy" from which today's generation of children could benefit. Patrice Ceisel, president of the park's advisory council, thanked the mayor for creating a park and "not a development." "It's a place we can come and enjoy nature," Ceisel said. Anyone else interested in joining the park's advisory council can get in touch with Ceisel at westridgenaturepreserve.org. Emanuel, who said he'd just come from dropping his son off at college, said his interest in the park began 12 years ago when he was a state congressman, a project he eventually came to support — securing $2.3 million in federal funds, he said. The development was a joint project between the city's Department of Transportation and Park District and is now a place "where the community comes together," the mayor said. "It's the beauty of seeing multiple generations, multiple people from all different neighborhoods and parts of the city all here, which is a testament ... to what people care passionately about," he said. "I would say to everybody in Streeterville, come on up here, see what this beautiful nature preserve is." West Ridge resident, Sharon, who did not want to give her last name, came to enjoy the day with her 3-year-old son Desmond and 1-year-old daughter Julia. 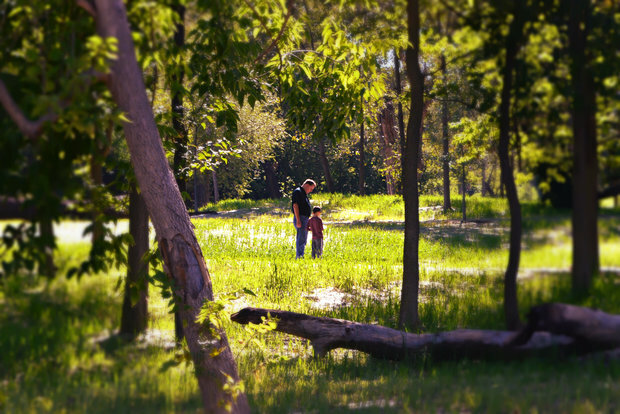 They were in the midst of playing an I-Spy nature game provided by the park's advisory council when they took a break to check out the fishing rods and lagoon. 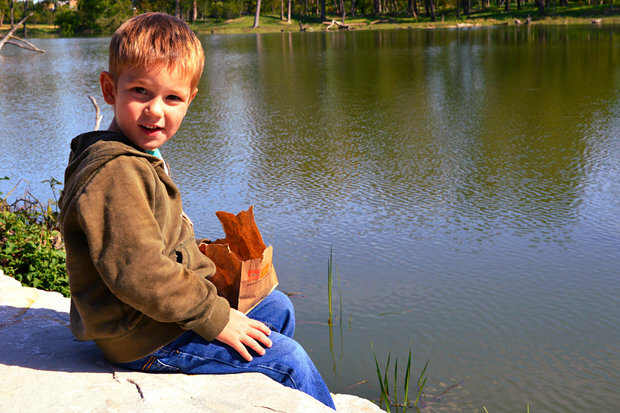 Though the lagoon is currently stocked with its usual carp and bullhead, next spring a fresh haul of bluegill and catfish will make its way to the park, officials said. Sharon said she was excited the park was "finally open," adding that the additional foot traffic may be a positive turning point for some local businesses across the street, as well as a step toward revitalizing the area around Western Avenue in general. "I'm glad to see the land is being put to public use," she said. Sisters Ambreen and Basmah Maan said they live just blocks from the preserve and had been checking up on its progress over the months since first hearing a park would replace the formerly unused marsh. The two said they wanted a "nice green space" in the neighborhood that would be within walking distance of their home, something they've found in the preserve. "I love it so far," Ambreen said. Despite delays in the park's opening, O'Connor said ultimately he felt the preserve was a success. "A day like today is a home run," he said.